Andy has worked as a composer, producer, musician, sound engineer, video maker and graphic designer and holds a BA in Fine Art from Newport Art College. Andy’s work has taken him to many places, from performing with his band at the Albert Hall and recording orchestras at Abbey Road to DJing in Tower Records in Tokyo and mixing albums in Los Angeles. He has been fortunate enough to have collaborated with artists including Madonna and Massive Attack, and has written music for many films and television programmes. 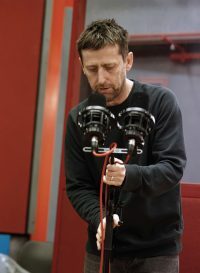 Andy has been recording at Christchurch Studios for more than 20 years and really enjoys working with the students, recording voices, creating sound effects and writing music for the short films made here. He loves the fact that the students get access to such an incredible and rare facility.